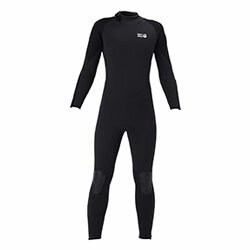 Superstretch materials provide outstanding fit and exercise performance.This wetsuit is markedly easier to get in and out of than the basic model. The front panels are equipped with a fine mesh skin that helps enhance mobility, strength, and heat retention. Smooth skin piping provides excellent elasticity and waterproofness. An inner zipper guard separates the zipper from direct contact with the skin. Cost-effective flat seams are precisely sewn using Japanese-made sewing machines. YKK zippers provide maximum reliability in a component that undergoes strenuous use.